In the last few years, Nikon dominated the world of 'megapixel' full frame photography with their D800 and D810 cameras. Ever since the EOS-1Ds Mk III was discontinued by Canon and followed by the EOS-5D Mk III in 2012, equipped with a 22MP full frame sensor, many photographers are wondering when Canon will respond to the challenge. Now Canon has announced the EOS-5Ds and EOS-5Ds R 50MP full frame cameras with a delivery date of late June. On the face of it, Canon has retaken the MegaPixel crown so let us take a quick comparison of the two DSLR's main features from the stand point of a wildlife photographer. Sensor : The EOS-5Ds has a 50MP sensor with a low-pass filter. D810 comes with a 36MP sensor and lacks the filter. My readers know I am not a fan of chasing megapixels. Anything over a low to mid 20MP sensor on a full frame camera is an overkill for me in wildlife photography. Shooting speed is more important for a wildlife photographer like myself. The 5fps and maximum 14 RAW file buffer on the Canon EOS-5Ds is too slow for me, even in 1.3x and 1.6x mode. The Nikon D810's speed improves to 7 fps in crop mode and maxes out with a 23 RAW file buffer, due to its lower pixel count sensor. Lighting fast AF is crucial in capturing wildlife action. The EOS-5Ds has a newer, more robust 61 points system, with 41 more accurate cross-type points but only 1 center f/8 cross-type point. By comparison, the D810 offers less total and cross-type points, 51 and 15, but 7 more f/8 cross-type points. This comes in handy when using long lens and extenders to bring the action closer. Low light performance is another crucial consideration in wildlife photography. Canon's EOS-5Ds comes with 1/3 increment adjustment from ISO 100 to 6400. Nikon's D810 offers better native ISO range, from 64 to 12,800, expandable to 32 - 51,200. The EOS-5Ds offers a more advanced metering system with a 150,000 pixel RGB/IR sensor while the D810 has a 91,000 pixel RGB system. Battery life is another factor out in the field and the Nikon D810 has the edge here with a rated 1,200 shots in between charge while the Canon EOS-5Ds is rated at only 700 shots. The former comes with a built-in, pop up flash while the latter lacks one. Both cameras are made of magnesium alloy, weather sealed and professional grade. The EOS-5Ds is slightly lighter at 29.8 oz and has a LCD screen with fewer pixels (1040K) while the D810 boasts a 1229K resolution LCD screen and weighs 31.1 oz. The two cameras are pretty much evenly matched. The EOS-5Ds has the edge in AF, resolution and metering while the D810 wins in the high ISO and speed contest. Both cameras fall short compared to the Canon EOS-1D X and EOS-7D Mk II when it comes to wildlife photography. 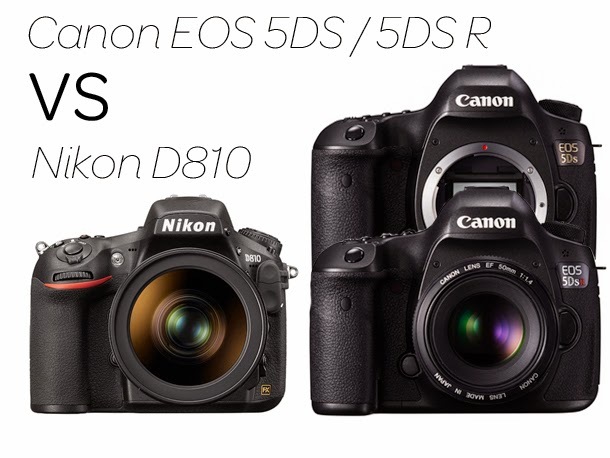 I will not be buying the EOS-5Ds but will wait for the EOS-5D Mk IV and the EOS-1D X Mk II later this year. Both cameras are quite good for landscape and wedding photography but 'unsuitable' for a wildlife photographer like myself.